Promotes prosperity. Dissipates and transmutes negative energy, therefore never needs clearing. Known as the “Merchant’s Stone”. Balances the yin-yang energy and all chakras. Fosters creativity, generosity, pleasure, protection, strength, alignment, career success, enjoyment of life and spiritual growth. Stimulates openness. Stabilizes emotions, dispels anger, brings joy. Carrying the power of the sun, Citrine is an exceedingly beneficial stone. It is warming, energizing and is one of the few crystals that never needs cleansing. It absorbs, transmutes, dissipates and grounds negative energy and is therefore extremely protective for the environment. 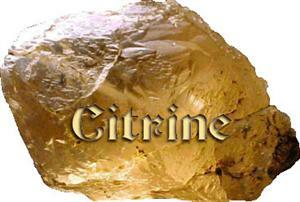 The history of Citrine is closely interwoven with that of Topaz, and coincides with it completely when it comes to the interpretation of alleged miraculous powers. However, Citrine is a member of the large quartz family, a family which, with its multitude of colors and various structures, offers gemstone lovers almost everything their hearts desire in terms of adornment and decoration. The name Citrine is derived from the color – the yellow of the lemon – although the most sought after stones have a clear, radiant yellowish to brownish red. Citrine energizes every level of life. As an aura protector, it acts as an early warning system so that action can be taken to protect oneself. It has the ability to cleanse the Chakras, especially the solar plexus and navel chakras. It activates the crown chakra and opens the intuition. Citrine cleanses and balances the subtle bodies, aligning them with the physical. Citrine is one of the stones of abundance. This dynamic stone teaches how to manifest and attracts wealth and prosperity, success and all good things. Citrine is a happy generous stone and encourages sharing what you have and yet helps you to hold on to your wealth. It has the power to impart joy to all who behold it. Gloom and negativity have no place around Citrine. It is a useful stone for smoothing group or family discord. Psychologically, Citrine raises self-esteem and self-confidence and removes destructive tendencies. It enhances individuality, improves motivation, activates creativity and encourages self-expression. It makes you less sensitive, especially to criticism, and encourages acting on constructive criticism. It helps you develop a positive attitude and to look forward optimistically, going with the flow instead of hanging on to the past. This stone promotes enjoyment of new experiences and encourages exploring every possible avenue until you find the best solution. Mentally, Citrine enhances concentration and revitalizes the mind. It is excellent for overcoming depression, fears and phobias. Citrine promotes inner calm so that wisdom can emerge. It helps in digesting information, analyzing situations and steering them in a positive direction. This stone awakes the higher mind. Wearing a Citrine pendant overcomes difficulty in verbalizing thoughts and feelings. Emotionally, Citrine promotes joy in life. It releases negative traits, fears and feelings at the deepest of levels. It overcomes fear of responsibility and stops anger. This stone helps you move into the flow of feelings and become emotionally balanced. Physically, Citrine imparts energy and invigoration to the physical body. It is useful for people who are particularly sensitive to environmental and other outside influences. Citrine is an excellent stone for energizing and recharging. It is highly beneficial for reversing degenerative disease. Citrine stimulates digestion, the spleen, and the pancreas. It negates infections in the kidney and bladder, helps eye problems, increases blood circulation, detoxifies the blood, activates the thymus and balances the thyroid. It has a warming effect and fortifies the nerves. Citrine is an eliminator – it relieves constipation and removes cellulite. As an elixir, it is helpful for menstrual problems and menopausal symptoms such as hot flashes, balancing the hormones and alleviating fatigue. Wear this gemstone on your fingers or throat in contact with the skin. Wearing a Citrine point down brings the golden ray of Spirit into the physical realm. Position the stone as appropriate for healing. Use a sphere for meditation. Place it in the wealth corner (the wealth corner is the farthest back left point from your front door or the door into an individual room) of your home or business, or in your cash box. Wearing or owning Citrine will certainly improve your life both physically and mentally. It will most assuredly convince you of the magical properties contained within the gemstone world and will provide you not only with pleasure and good health, but with added abundance as well. Moon 29° Scorpio 31' 11"